Super-strong suction cups are produced from high-quality material that will not yellow, deteriorate, or lose adhesion over time. Light diffusing rings prevent focused light from damaging surfaces. 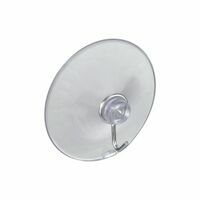 Holds securely in all types of weather, Super-strong suction cups are produced from high-quality material that will not yellow, deteriorate, or lose adhesion over time. Light diffusing rings prevent focused light from damaging surfaces. Holds securely in all types of weather, Provide a tight hold on smooth, non-porous surfaces, including appliances, windows, mirrors and tile. Do not use to hang breakable items. 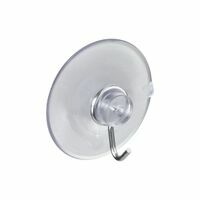 National Hardware Suction Cup, Series: V2524, Medium Trade, 2 lb, PVC/Steel, Clear, For Home and Office National Hardware Suction Cup, Series: V2524, Large Trade, 2 lb, PVC/Steel, Clear, For Home and Office Provide a tight hold on smooth, non-porous surfaces, including appliances, windows, mirrors and tile. Do not use to hang breakable items.